There are many abilities in A Tempest Season. Abilities consist of skills, spells and gifts. Each ability has a certain function and levels. The following page will explain how they work. Skills The name of the skill. Target The valid target type: single target, self only, etc Note: Passive and Auto cannot be used directly. Affects The area of affect for this skill: single, group, etc. Stamina The stamina cost of the skill. Use(Reuse) Use: The number of seconds you’re in delay for using the skill. Reuse: The duration this cannot be used. Most skills have short reuse times, but some more powerful ones have very long reuse times. Train Many skills have levels associated with them but not all do. The first word in cyan is the skill level (ie: Godly or Novice). The second part in white, are the number of uses left before it can be leveled up. Note: It is not a requirement to reach 0 uses in order to level up a skill. Level The required character level for this skill. Green indicates you can use it, and red indicates you cannot. The skill screen has a Simple Mode, which greatly reduces the information displayed. X SPELLS The category of the spells – in this example Fire spells are displayed. Affects The area of affect for this spells: single, group, etc. Drain The essence and elemental charge cost of the spell. The color indicates the charge type and the + or – indicates if a charge is added on use or subtracted. In the above, Fire Bolt takes 10 essence and adds 1 fire charge. Fire ball takes 20 essence and requires 2 fire charges to cast. Use(Reuse) Use: The number of seconds you’re in delay for using the spell. Reuse: The duration this cannot be used. Most skills have short reuse times, but some more powerful ones have very long reuse times. Train Many spells have levels associated with them but not all do. The first word in cyan is the spell level (ie: Godly or Novice). The second part in white, are the number of uses left before it can be leveled up. Note: It is not a requirement to reach 0 uses in order to level up a spell. Level The required character level for this spell. Green indicates you can use it, and red indicates you cannot. The spell screen has a Simple Mode, which greatly reduces the information displayed. X GIFTS The category of the gifts – in this example Basic gifts are displayed. Affects The area of affect for this gift: single, group, etc. Min-Max The minimum and maximum amount of favors that can be spent on this gift. Mod For each favor spent above the min, the gift will increase in by power # points. For example, Vitality will heal an extra 9 health per point spent over 1. Use(Reuse) Use: The number of seconds you’re in delay for using the gift. Reuse: The duration this cannot be used. Most gifts have short or no reuse times, but some more powerful ones have very long reuse times. Train Most gifts do not have levels associated with them but some do. The first word in cyan is the spell level (ie: Godly or Novice). The second part in white, are the number of uses left before it can be leveled up. Note: It is not a requirement to reach 0 uses in order to level up a spell. In addition, the gift screen shows the progress to the next donation level for Clerics. The gift screen does not have a simple view, due to the integral information the gift screen provides. X VIRTUES The category of the virtues: Good, Neutral and Evil. Affects The area of affect for this virtue: single, group, etc. Use(Reuse) Use: The number of seconds you’re in delay for using the virtue. Reuse: The duration this cannot be used. Most virtues have medium length reuse times, but some more powerful ones have very long reuse times. Train Virtues have levels associated with them, increasing their power. The first word in cyan is the virtue level (ie: Awakening Faith). The second part in white, are the number of uses left before it can be leveled up. Note: It is not a requirement to reach 0 uses in order to level up a spell. Gadgets The name of this gadget. Steam The amount of steam this takes on use or each minute. Use(Reuse) Use: The number of seconds you’re in delay for using the gadget. Reuse: The duration this cannot be used. Equipped If this gadget is equipped or not. Each gadget adds to the passive upkeep cost. This is calculated each minute and drained from your personal steam generator. See the section on Using Gadgets for more information! 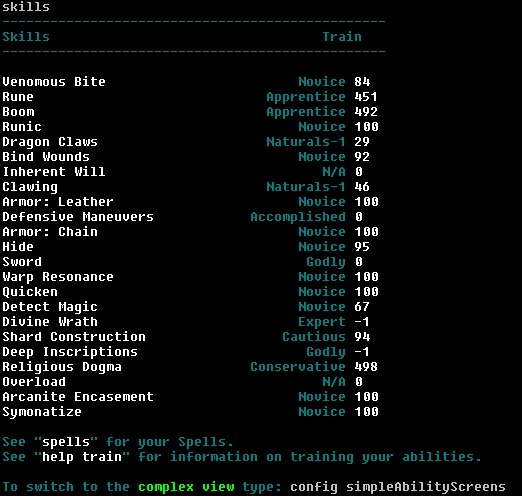 The following explains how to use skills, spells and others. Each are slightly different. Many ability names can be abbreviated, most often, using the first character. Experiment to see how short you can make your ability names! 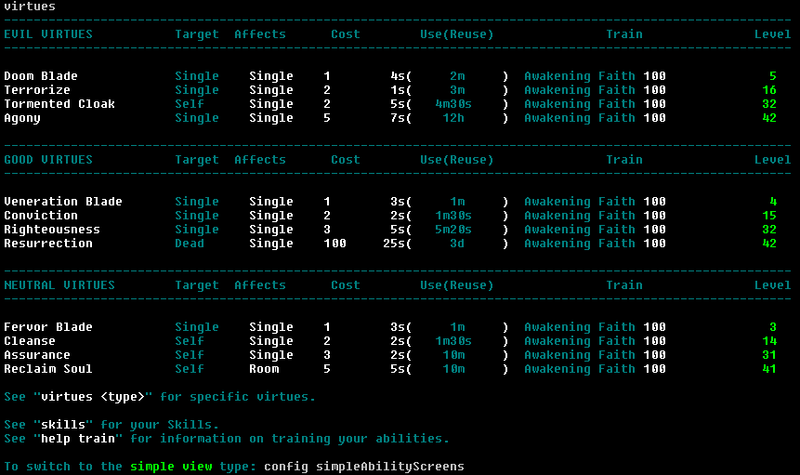 The game will perform an automatic lookup for skills if an invalid command was detected. The majority of skill names are invalid game commands. To use a skill that has multiple words in it, type the name without spaces. For example: use dropkick dayrinni.. Using a spell is easy to do. To use a spell that has multiple words in it, type the name without spaces. For example: cast fireball dayrinni. Using a gift is easy to do. Clerics need to specify the amount of favors they’re using on each gift. Each gift has a minimum and maximum amount of favors. The amounts can be seen on the gifts command. To make it easier on the Cleric, the max word can be used to fully pump up a gift. Using a virtue is easy to do. Templars need to have the correct amount of favors and meet the necessary alignment requirements. You may only use Good virtues while in a Good alignment, Neutral in a Neutral Alignment (except Fervor Blade) and Evil in an Evil alignment. First, a gadget must be equipped before it may be used. For example, gadget equip Wrist Gun would equip the clockwork wrist gun, a powerful steam based weapon. For example, crank wristgun dayrinni would fire the gun at Dayrinni. Steam is used to power the Agents gadgets Any equipped gadget takes steam which is drained every minute by a %. The more gadgets equipped, the stronger the drain. Additionally, gadgets take some steam upon activation (passive gadgets do not). This will restore the indicated value as a %. If left blank, the amount restored will be 100%. Cranking the generator and restoring the steam. As you adventure, your abilities and specializations will be able to raise up in level. To train an ability or specialization to the next level visit the trainer in Tralisia. In the above, several skills can be trained to the next level: defensive maneuvers, fanaticism, fix and several others. Each ability costs gold and sometimes a tier point to raise up in level. For example: train ability 1 would train the Bind Wounds skill to the next level. 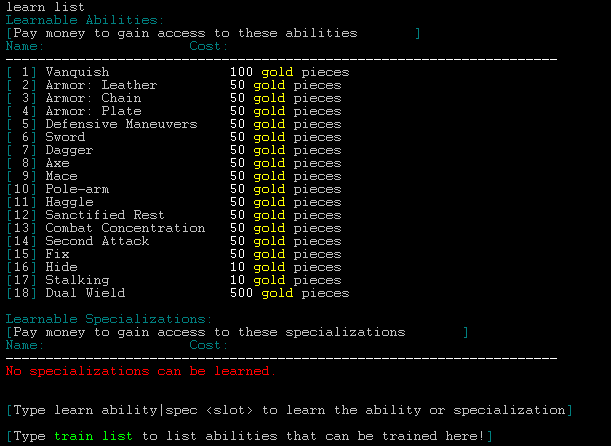 As mentioned above, the cost to train an ability or specialization requires gold and sometimes a tier point. Tier points are used to level up abilities and specializations. Generally, the first few levels of an ability does not require a Tier Point – only the higher levels do! There are many ways to gain tier points, which are explained below. Tier points are gained during level up of your character’s normal level. Some classes receive extra tier points throughout their advancement, which is based on the number of abilities they ultimately receive. Mages, Rogues and Arcanist gain an extra tier point every 5 levels. For example, going from level 1 to 2 would grant you a single tier point. You may also buy up to 10 tier points at the trainer. Each tier point has a cost, starting from 500 gold to 3,500 gold for the last point. Some quests award tier points upon completion – so go out and explore! The dynamic quests offered by Dar’larna also have a small chance to award a tier point. She can be found in the Swordspire Training Hall, west of the center of town. At level 100, all experience gained by your character goes into generating tier points. There is no limit to the amount of tier points earned. Remember, you can earn any amount of tier points long term. So feel free to experiment after you reach the maximum level! Many abilities require a currency cost to level up. If the ability has uses, this cost will be prorated against the remaining amount. For example, if a skill has 50 out of 100 uses, the cost would be reduced by 50%! If you’re short on currency, it may be cheaper to practice your abilities to gain uses to lower the training currency cost! Not all abilities have uses. Specializations do not have uses and thus their cost cannot be lowered in this manner. Abilities that can be trained have levels associated with them. The average amount of levels is 3, 5 and 10. To see the maximum level of an ability, see its help file. There are some abilities that follow different adjectives for their levels, such as Shard Construction. However, the vast majority of the abilities in the game use the above. You may reset your characters tier points at the trainer for 5,000 gold. When doing so, all of your non-natural abilities and specializations will be set to level 1. You will receive all of your spent tier points and 75% of the spent ability points as a refund. Your Natural abilities will remain the same. If the refunded ability points go over your maximum capacity you will remain above the the maximum capacity until they are spent. Another way to practice your abilities besides using them is paying the trainer a small fee per use. The cost of each use is 10 silver. There can be cases were the ability cost can be quickly reduced by spending a small amount of gold. Practicing abilities at the trainer requires ability points and silver. Ability points are gained while leveling up your character’s level and killing monsters in combat. The more monsters killed, the more ability points you’re character acquires. These can be used to gain cheap uses at the trainer. For example: practice 1 100 would practice Bind Wounds for 100 uses at a cost of 1,000 silver or 10 gold. Remember, each ability point spent on an ability lowers the training cost. It may be a good idea to practice an ability with 1 ability point and check how much the price drops by typing train list. It could be cheaper to use ability points before training!! You may also learn new abilities and specializations. These can be learned at the trainer in Tralisia as well as from items in the game. The learn command is used to do this. To view the abilities that can be learned, while at the trainer type learn list. It is also possible to learn new abilities and specializations from items, such as tomes, manuals, books and scrolls. Mages learn spells and specializations from tomes from the Magic Shop located in the Merchant District.